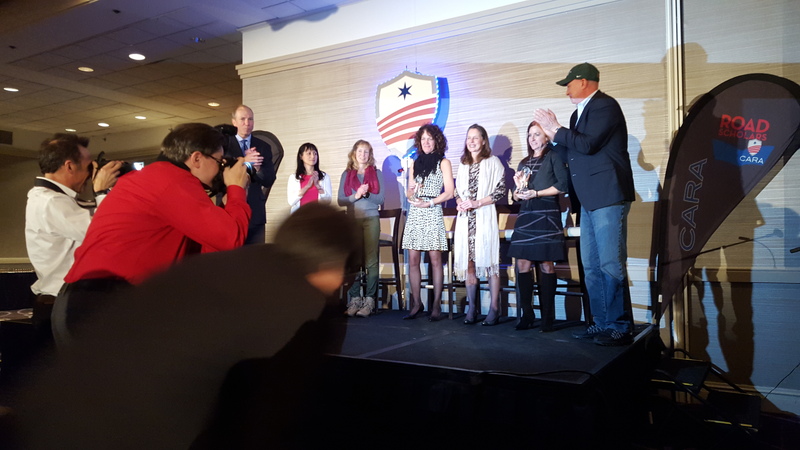 On February 6, 2016, Jenny and her 1996 Trials teammates were awarded the prestigious Lifetime Achievement Award at the annual Chicago Area Runners Association banquet in downtown Chicago. Jenny Spangler was awarded the CARA Lifetime Achievement Award on February 6 at the CARA annual awards banquet. The award was presented to Jenny for her outstanding contributions over the years to the sport of distance running, both as an elite athlete, and as a mentor and coach. Jenny was joined by her 1996 Olympic Marathon trials teammates and dear friends Ann Schaefers-Coles, Laurie Mizener, Jane Murphy, and Janeth Salazar-Ohst. Ann and Jane were also awarded the CARA Lifetime Achievement Award. The award was presented by Executive Director of the Bank of America Chicago Marathon, Carey Pinkowski, and Executive Director of CARA, Ed Zylka.